Reading this one-of-a-kind collection of practical advice is like taking a fising trip across the country with over twenty-five of the world's fly-fishing experts. Over 1,001 of the best fly-fishing tips compiled by the former managing editor of Fly Fisherman magazine cover essentials from trout to tarpon, such as: casting with Lefty Kreh, matching the hatch with Charlie Meck, taking great fish photos with Barry and Cathy Beck, mastering mayflies with John Barr, catching selective trout with Mike Lawson, West Coast stripers with Dan Blanton, steelhead secrets with Lani Waller, and Spey casting with Simon Gawesworth. With clear, use-to-use format, 160 illustrations from renowned artist Dave Hall, and encyclopedic coverage of almost everything that's important to know about fresh and saltwater fly fishing, this book is sure to help beginners and experts alike catch more fish. Love this book. ALot of great tips and tricks. This is a great read, it is full of info that should help any angler whether you've been fishing for years or just starting . I didn't find the "fishing tips" to be all that helpful. The book was mostly a rehash of stuff I have read in other magazines/books. Not worth the price. Maybe buy it if you are new to fly fishing. I purchased this book for my husband for Christmas. He loves it! Lots of really good information that we didn't know. I have been flyfishing for a long time. I found in this book many tips that will make my fishing more enjoyable. I recommend it. 5.0 out of 5 starsExcellent book!!!!!!!!!! Every tip it's a lesson of fly fishing. All the experience of these great fishers in one book. Thanks masters!!!!!!! 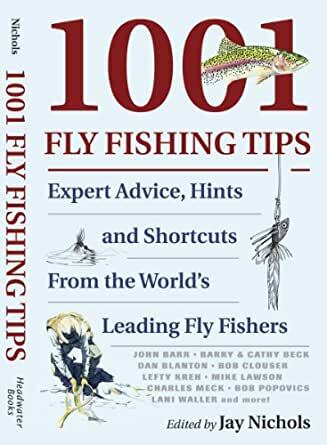 1001 Fly-fishing Tips: Expert Advice, Hints, and Shortcuts from the World's Leading Fly-fishers edited by Jay Nichols and Illustrator by Dave Hall is a great book. This book is excerpt from sum of the "Worlds leading Fly Fishing" experts. Nicholas the editor is best known as editor of Fly Fisherman Magazine. As far as my feelings I can only say Wow, I really liked this book at first I thought it was just going to be a sort of list book but I was very happy to see it covers most aspects of fly-fishing in an easy accurate fun way. However, on a light note, let me be the first to tell you that I did not count all one thousand and one tips because I could not see any visible way they were represented, so I do not guarantee there is that many (but there is definitely a lot). This book does give a lot of great tips and a good overview of fly-fishing from how to remove a hook to how to restore an old dead fly. This book even goes in to saltwater tips, traveling and many other specialty concepts that help to shed light on the many intricacies in fly-fishing. Sadly they did not breach the subject of fly tying (except to say make enough or buy enough) even with a whole chapter dedicated to the fly. With all this said this book is clear concise and has many tips sprinkled in for good measure. Over all 1001 Fly-fishing Tips, is a great over view of fly-fishing and one that I would want on my bookshelf.